This entry was posted in By country, East Germany, Germany, Iceland, TV and tagged Deutschland 83, Trapped by Mrs P.. Bookmark the permalink. You’re welcome, Margot. It looks very suspenseful – hoping it’s a good one and will report! I’ve been enjoying Deutschland 83 and this Icelandic one sounds interesting as well. Spoilt for choice, we are! I’m going to be quite bereft after the D83 finale next week. But you’re right, we’re pretty spoiled for choice at the moment. I’ve been thinking a lot this autumn about the rise of international crime drama in the UK since 2011, and how it’s moved from being fairly rare to now being positively mainstream. I’m noticing that difference through the blog in particular – it’s hard for me to keep up with everything now! Yikes! That looks scary. Time to be surrounded by loads of cushions just in case I need to hide. Lol! Seriously though, it does look very dark and full of suspense. Just what we’ve come to expect from BBC4, and long may it continue. It does, doesn’t it? I don’t do too well with peril, so may need to follow your lead on the cushion front. As long as it isn’t *all* like that, we’ll be fine. Ah yes, where would we be without BBC4 (though Channel 4 may be coming up on the inside track after Deutschland 83…). Evening Mrs P. Well I’ve just finished watching the final episodes of Trapped, and I’m bereft already 😢. Saturday’s won’t he the same. It was a fantastic series, and I can’t rate it highly enough. I really hope we get to see Andri and his team again. Whether Follow the Money will live up to Trapped remains to be seen….. So glad you enjoyed, Kathy! Thought the finale was brilliant and really brought out the human costs both of committing crimes and investigating them. Some fantastic acting and I’m totally with you – a second series please! I haven’t watched Follow the Money yet. Have to confess there’s too much TV crime drama on for me to handle at the moment. May have to let this one pass. In case you haven’t seen this…an interesting UK map of sites where UK filming of UK crime/mystery series have taken place. I am sure you will contact the creator to verify before posting for your readers. I enjoy your newsletter. Thank you from Canada. Thanks again and I’m glad you’re enjoy the blog. With best wishes from Wales. On BBC4 tonight in the same slot as The Bridge, The Killings and Borgen. Now that’s a mark of quality. Stark, cold, bloody and suspenseful – I can’t wait! Absolutely loved it! Had the log burner going full on and looking forward to next week! Can see a holiday being booked – my sort of place ! Sounds like an excellent strategy, Patricia – that log burner will keep the Icelandic cold nicely at bay. Looking forward to next week too – looks like it could get rather dark! 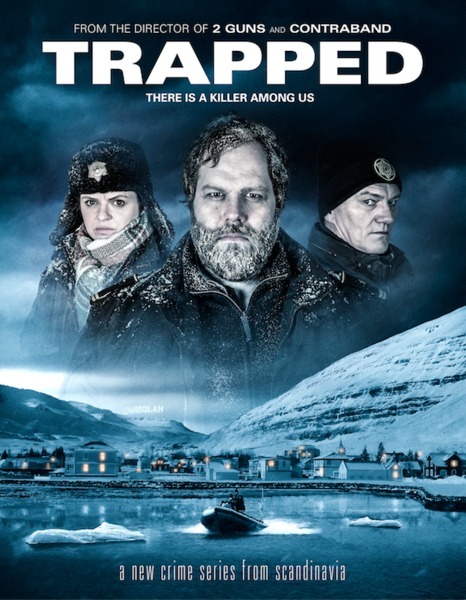 Saw Trapped last night, it was absolutely brilliant, I’m hooked!! When does it continue… next Saturday I guess? Good to hear, thewhiteroomse4! Yes, next Saturday at 9.00 (the dedicated BBC4 crime drama slot). I Look for your tweets for reviews on tweetdeck. Have enjoyed Deutchland83….though the ending was as seems to be the norm these days a bit vague. Trapped is watchable but seems to be very similar to Fortitude which we didn’t return to after the first series. I think they try to put too much action in which is unrealistic for a small place. Thanks, WynneC. Yes, the D83 ending was left quite open in many ways, which seems to be because the Wingers are hoping to shoot another series. 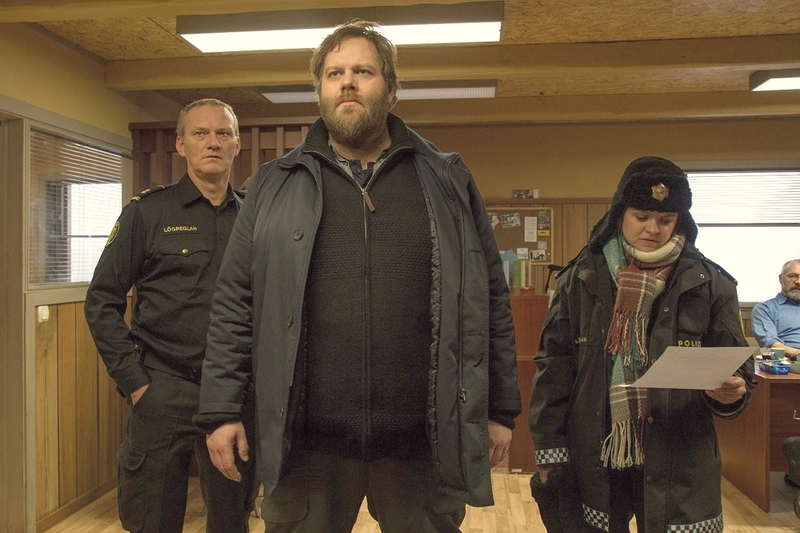 I didn’t see Fortitude, but from what people were saying, it didn’t quite live up to its original promise. I take your point about cramming lots of action into a setting that suggests a sleepier pace… Will wait to see how the next couple of episodes shape up. I’ve heard that things get considerably darker.